For only £1 extra we will include a face shield with one way valve. Please let us know how many kits you want by email. You can pay with Paypal, cheque or bank transfer. Let us know your preference. A full UK VAT invoice/receipt can be supplied. 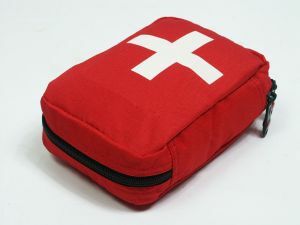 This is a personal first aid kit suitable for having in the home or car or for taking out on trips, trekking, camping, holidays etc., and may not be suitable for some work or school environments due to the potentially harmful items included. This kit covers the minimum contents laid down by the HSE plus some additional items for personal use. NB: This list should be amended as necessary for your circumstances, as this is a general overview. ABC Training accepts no responsibility for the contents of your first aid kit. * Some organisations prefer these items not to be included. Quantities depend on number of children, age, and frequency of use. This kit follows the minimum contents laid down by the HSE. Individually wrapped ´sterile adhesive dressings´ (plasters) - HYPOALLERGENIC. Should be individually wrapped and in different sizes. Written confirmation can be sought from parents and ´normal´ sticking plasters can be used on these children. Waterproof plasters can be used if appropriate, but fabric plasters allow the wound to heal better. A range of sterile dressings of various sizes appropriate for age of children. They are easier and quicker to apply if the dressing comes attached to a bandage. Triangular bandages - useful as slings or to immobilise. Scissors to cut bandages and safety pins to hold them in place. Use medical scissors (rounded ends). Sterile gauze pads for cleaning and covering wounds (Do not use cotton wool - this leaves particles in the wound). A finger bandage (tubegauze) and applicator. 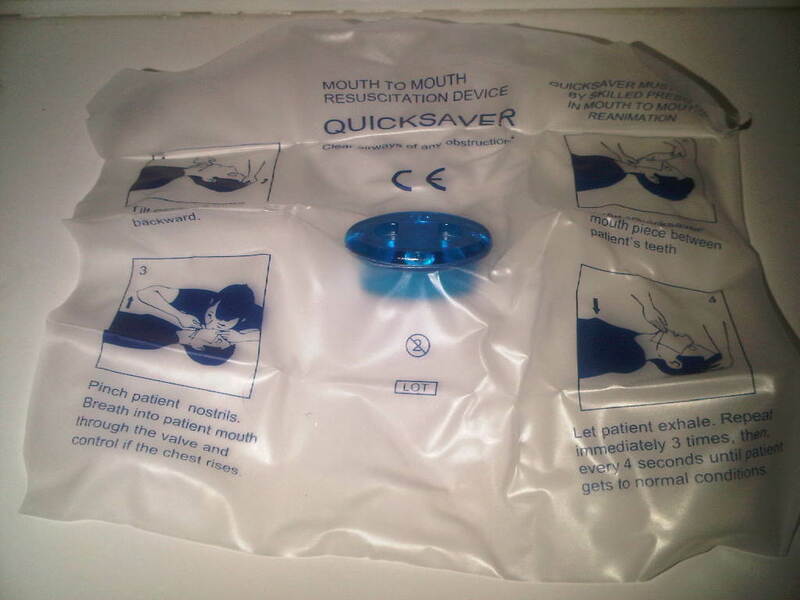 Disposable gloves, resuscitation shield or mask and plastic bag for disposal. Always wear gloves when coming into contact with blood and bodily fluids. DO NOT INCLUDE: Sprays, medicated wipes, lotions or creams (allergies), tablets or proprietary medicines. Only ever give a child medication brought by a parent on written instructions from that parent. Keep Accident & Incident Record Book in a safe accessible place. Keep the First Aid Kit in a green airtight container with a white cross and labelled as a first aid kit. If this is kept in a cupboard for example, the door should be labelled "First Aid Kit in here". Ensure that the first aid kit is replenished whenever it is used so inappropriate equipment is not used. Have a spares box! It is a legal requirement to log all accidents/incidents in the accident book. Please consult person in charge of health and safety for any necessary additions or exemptions. Quantities depend on number of people, age, and frequency of use. This kit follows the minimum contents laid down by the HSE. Individually wrapped ´sterile adhesive dressings´ (plasters) - preferably HYPOALLERGENIC. Ideally individually wrapped and in different sizes. A range of sterile dressings of various sizes appropriate for different sized wounds. Keep Accident & Incident Record Book in a safe accessible place. Keep the First Aid Kit in a green airtight container with a white cross and labelled as a first aid kit. If this is kept in a cupboard for example, the door should be labelled "First Aid Kit in here" with white cross on green background symbol. Ensure that the first aid kit is replenished whenever it is used so inappropriate equipment is not used. It is a legal requirement to log all incidents in the accident book. First aid supplies, First aid kits, First aid kit refills and First aid products from one of the leading UK suppliers of first aid equipment. Personal First Aid Kits, Domestic First Aid Kits and School First Aid Kits are available at competitive prices. © 2019 ABC First Aid & Safety Training Ltd, All rights reserved.